Memorial vases are another very popular option. Remco offers a wide variety of quality memorial vase options to fit any size or style of memorial. For more information on Remco Memorial vases, contact us today. 0-6" x 0-6" x 0-10"
0-3 3/4" x 0-3 3/4" x 0-9 1/2"
Also available in Silver Grey, Sapphire Blue & Bronze colour. 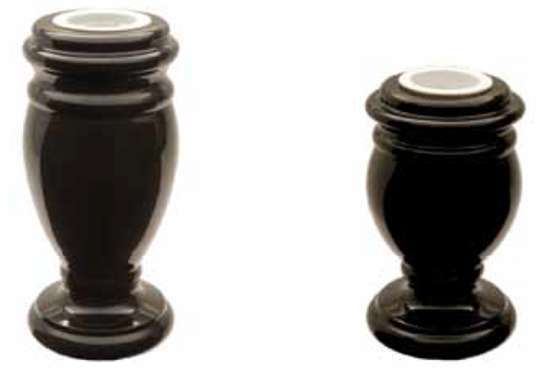 0-3 3/4" x 0-3 3/4" x 0-9 3/4"
Also available in Ebony Black, Sapphire Blue & Bronze colour. Reversible vases for flat markers allow for the vase to be stored for the winter. This helps protect the vase from the elements. Also available in Ebony Black, Silver Grey & Bronze colour. Also available in Ebony Black, Blue Saphire & Bronze colour.